Can you imagine taking a picture with your smartphone camera and then print it in minutes? (and still produce great quality prints without the need of Polaroid camera). You can do that with camera phone printers. 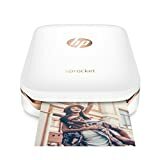 In this article, I’ve reviewed the best phone printers you can buy in 2017. If you ever wanted to print photos from your phone, now you can. It’s compatible with both Android and iOS phones and tablets too. Small size and a minimalist design with rounded corners makes this lovely piece of technology portable. 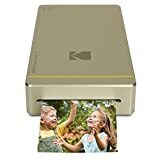 The Kodak Mini Printer is completely wireless and it connects via Wi-Fi or NFC depending on what the device you are connecting it to is supporting. To be able to print you must have the Kodak app. When you connect the printer to your device for the first time it automatically takes to the download page (if not, it is available on the App store or Google Play store and it’s free). The app allows you to print photos form your phone gallery or you can access your camera to take another photo. You can also connect to a social media and print any of photos you previously posted. A photo printer slightly larger than a deck of playing cards it’s highly portable and really easy to use. You can connect it to your iOS or Android device via Bluetooth, but again, you have to download the app for it (it’s free). The body is minimal with only one button to turn it on and only one port for Micro-USB charger. It has a built-in battery that lasts for about 25 prints. Back to the app! The app allows you to print photos form your phone gallery or you can access your camera to take another photo. it also has some basic editing options like filters, frames and stickers, and you can also add text or draw on photos. If you have an account on any social media, you know what I’m talking about. It is really simple and fun to use and photos come out even better than you might expect. 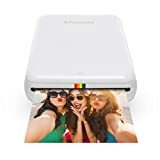 Small, lightweight and relatively affordable Fujifilm Instax Smartphone printer uses a 10-print cartridge of instant film just like Polaroid cameras. It also uses the app in order to print, but you can also edit your photos there. The app includes applying a black-and-white or sepia filter or Fujifilm’s Intelligence Filter, rotating an image and cropping. You connect it to your phone just like the previous printers, only this one works a little faster. The whole printing process is being done in about 30 seconds. Which one will you buy? Let me know in the comments!